Today’s Weißeritztalbahn interest group was founded by dedicated railway enthusiasts in 1978 as one of the first associations: the AG 3/67. From then on, the operators of the railway have been supported by interest group members having volunteered countless hours. This cooperation has focused on helping in the construction of the railway track; operating the lounge car; reconstructing historically valuable vehicles; and operating the ticket agencies in Freital-Hainsberg, Freital-Coßmannsdorf, Malter and Seifersdorf. In addition, it has organized numerous special train journeys in cooperation with other associations. Right after the destruction by the floods in 2002, the interest group made great efforts to rebuild the railway; and it set an example by starting to offer special train journeys on the section from Seifersdorf to Dippoldiswalde, which was rebuilt with the help of donations. Since the reopening of the railway, special trains with interesting designs have been planned to be run in addition to the trains in daily operation. So come and enjoy our special events on the rebuilt Weißeritztalbahn railway! Altenberger Kräuterlikörfabrik: immer donnerstags Führungen mit anschließender Verkostung in der Schnapsfabrik von 1842. Schloss Dippoldiswalde: Museum Osterzgebirgsgalerie mit Darstellungen von Menschen und Landschaft des Osterzgebirges. Naturschutzgebiet Rabenauer Grund: Energielehrpfad der ESAG und Sagenweg im felsigen Kerbtal der Roten Weißeritz. Märchenwiese Reinhardtsgrimma: Die zehn beliebtesten Märchen anhand hölzerner Märchenfiguren spielerisch erkunden und entdecken. Wintersportort Altenberg: Die Stadt mit der berühmten Bob- und Rodelbahn auf dem Kamm des Osterzgebirges entdecken. The Weißeritztalbahn railway runs on the edge of the Eastern Ore Mountains, south of Dresden. Take the train to Freital-Hainsberg station on the Dresden-Chemnitz-Zwickau (KBS 510) railway line. There, you will have direct connections to the trains of the Weißeritztalbahn railway by using the Dresden S-Bahn (urban railway) and RegionalBahnen (regional trains) coming from the direction of Chemnitz. Moreover, you can take the Freital public bus No. A if you are coming from the direction of Dresden. This bus stops directly at Freital-Hainsberg and Freital Coßmannsdorf stations located near the narrow gauge railway station. For timetables for trains, trams and buses; please visit Verkehrsverbund Oberelbe (VVO – the Upper Elbe public transport authority). If you are driving to the Weißeritztalbahn railway, the fastest route to Freital-Hainsberg station is via the S194. In the late 1950s, Lokomotivbau Karl Marx (a former East German manufacturer of locomotives) located in Potsdam-Babelsberg further developed the small locomotive of Type Ns 4 into the new Type V 10 C designed to operate on narrow-gauge industrial railway lines and sidings. The first engines were sold in 1959. With 102 HP and a maximum speed of up to 15 miles (24 kilometers) per hour, they were designed rather for light duties in train or shunting service. Thanks to their variable track gauge, they could run on 600 mm (1 ft 11 5⁄8 in) to 1067 mm (3 ft 6 in) gauges. This flexibility in track gauge made the locomotives an export hit, with a total of 498 engines built until 1975. Two engines were operated on the siding of Schmiedeberg Gießerei (foundry) of which one locomotive was taken over by the Weißeritztalbahn interest group. The history of the Weißeritztalbahn railway began with a groundbreaking ceremony not far from the Rabenauer Mühle inn on July 16, 1881. First, the section to Schmiedeberg was opened on November 1, 1882. The entire line to Kipsdorf went into operation less than a year later, on September 3, 1883. During the construction of Malter Dam from 1908 to 1913, the rail section from Spechtritz to Dippoldiswalde needed to be relocated to a new, higher line. At the same time, a narrow gauge interchange track to Potschappel station was built in 1913. After further gap closures up to 1924, at least in theory, it was possible to offer direct train connections on the 750-mm (2 ft 5 1⁄2 in) narrow gauge line from Kipsdorf in the Eastern Ore Mountains to Strehla on the Elbe river. 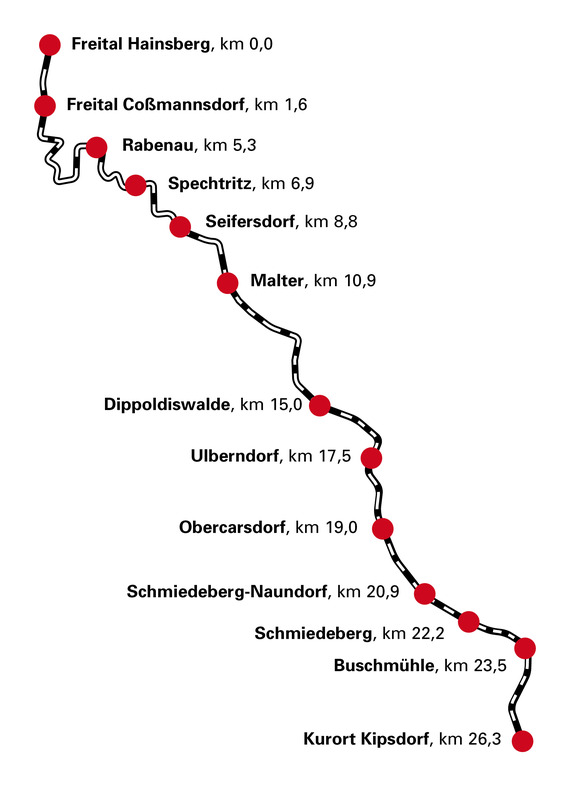 The route was relocated once again in 1924, with the railway having been removed between Obercarsdorf and Buschmühle as the routing was unfavorable for the traffic along the valley road. From then on, trains have run via the Schmiedeberg Viaduct. Thanks to the railway, the excursion traffic to the Eastern Ore Mountains has developed early. In 1934, the terminal station in Kipsdorf was extended substantially for winter sports traffic. Excursion traffic continued during the period of the GDR, especially to Malter Dam and into Rabenauer Grund valley. This was why, in 1975, it was decided to preserve the Weißeritztalbahn railway line. The entire railway line was listed by the then created Free State of Saxony on March 14, 1994.